In a salute to Ronald Reagan, President Bush is helping dedicate a new Air Force One exhibit at the former president's library, but his appearance at a GOP fundraiser while he's here has upset some California Republicans. Arnold Schwarzenegger became irked at Mr. Bush for making an appearance in order to raise money from the same Republicans the governor wants help from in a special election fight. So, in retaliation, Schwarzenegger is snubbing the president's biggest public appearance in the state. Republican politicians rarely pass up the chance to associate themselves with Reagan. But the governor was blunt in turning down the president's request to join him. 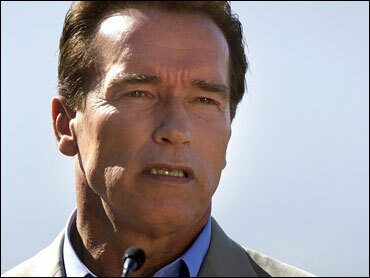 "We're very busy in our campaigning up and down the state," Schwarzenegger told reporters. Mr. Bush was to join former first lady Nancy Reagan in Simi Valley on Friday to officially open a new pavilion at the Ronald Reagan Presidential Library that features a Boeing 707, which carried Reagan and six other presidents. The Air Force One Pavilion, which also houses a former Marine One helicopter, a presidential limousine and a replica of an Irish pub, tells the story of Reagan's two-term presidency. Visitors who tour the retired Air Force One will see Reagan's beloved jelly beans on the plane's presidential conference table. Bush traveled cross-country aboard a Boeing 747, flying 475 mph at 32,000 feet on a flight path over Bowling Green, Ky., Tulsa, Okla., and Albuquerque, New Mexico. What he did when he landed Thursday evening in California, however, didn't suit some members of the state GOP. They said his appearance at a $1 million Republican National Committee fundraiser was poorly timed because of the upcoming Nov. 8 special gubernatorial election. Schwarzenegger is trying to court independents and Democrats, two voter blocs that typically haven't supported Bush. But Schwarzenegger rebuffed requests from leading California Democrats that he break from his special election campaign long enough to ask President Bush for more federal money. The Republican governor said he was too busy before the Nov. 8 vote to meet with the president during Bush's two-day stop in Southern California on Thursday and Friday. But Schwarzenegger also said he was not happy that Bush was raising money in California so close to the special election. "We would have appreciated it if he had done his fundraising after Nov. 8," Schwarzenegger said Wednesday. The governor has yet to reach his $50 million fundraising goal to promote his ballot initiatives, which would curb the power of the Democrat-controlled Legislature. Democrats criticized the governor's decision to skip the Bush events, saying Schwarzenegger is putting politics ahead of the needs of the state. "Apparently, the only thing that the governor is collecting is special interest money," said Assemblyman Dario Frommer, D-Los Angeles. The governor's campaign expressed disappointment that Bush would travel to the state to raise money just 2 1/2 weeks before the special election. "Unless President Bush is coming to California to hand over a check from the federal government to help us with the financial challenges we face, the visit seems ill-timed," said Karen Hanretty, a spokeswoman for the state Republican Party. An official connected with the California GOP fundraiser said those who attended also have contributed to Schwarzenegger's campaign coffers. Schwarzenegger chose not to attend the Thursday night fundraiser or the event at the library where Bush was to lay a wreath in memory of the late ex-president. During a campaign stop Wednesday in Anaheim, Schwarzenegger addressed why he was passing on the opportunity to sit with Mr. Bush. "We're in high gear right now for our campaign," he said. "So of course, right now, it's all about paying attention to that. So this is why I couldn't really accept the invitation to be part of the ceremony at the Reagan Library out there." But he also said he was not happy the president chose to visit California so close to the November election to raise money for the RNC. To date, Schwarzenegger has yet to reach his $50 million fundraising goal to promote his ballot initiatives. "I've met with the president several times in the past. We've worked together, and we have a good working relationship," Schwarzenegger said, adding, "... We would have appreciated it if he had done his fundraising after Nov. 8." Mr. Bush and Schwarzenegger long have had a tentative relationship, and they have sharp differences on social issues such as abortion, gay rights and stem cell research. Just days after Schwarzenegger's victory in the 2003 recall election, the governor-elect told a cheering crowd in San Bernardino that "there is no greater ally this Golden State has in Washington" than Mr. Bush, who stood beaming nearby. But Schwarzenegger also has been careful to maintain a certain distance from the president, who lost the state to Democrat John Kerry in the 2004 presidential contest and to Al Gore in 2000. For his part, Mr. Bush has taken advantage of the Republican governor's celebrity, most notably at the Republican National Convention in New York last year and in a campaign appearance in Ohio days before the 2004 election. Schwarzenegger was credited with helping Bush narrowly win that pivotal state.